Antonio Ethan Gates Jr. (born June 18, 1980) is an American football tight end for the San Diego Chargers of the National Football League (NFL). He has been selected into the Pro Bowl eight times and is a five-time All-Pro. Gates was signed as an undrafted free agent in 2003 after playing college basketball for Kent State University. He attended college at Kent State his junior and senior years after brief stints at Michigan State University and Eastern Michigan University. He is the Chargers' career leader in receptions, receiving yards, and receiving touchdowns. In 2015, he became the second tight end and ninth player overall to record 100 career touchdown receptions. Originally, Gates enrolled at Michigan State University wanting to play football under then-coach Nick Saban as well as basketball under coach Tom Izzo. Upon enrolling, he learned that Saban wanted him to play only football. Gates then chose to pursue playing basketball by transferring to Eastern Michigan University. He played there part of a season, subsequently played at two junior colleges, and eventually played two seasons at Kent State University in northeastern Ohio. As a Golden Flash, Gates played two seasons as power forward. His junior season he averaged 16.0 points, 8.1 rebounds and 2.7 assists per game. His junior season his team won its first regular season Mid-American Conference (MAC) championship in school history after finishing the regular season with a 24-5 overall record with a 17-1 record in the MAC. Gates helped the Golden Flashes win their second consecutive MAC tournament and earn its resulting berth in the 2002 NCAA Men's Division I Basketball Tournament In the NCAA tournament he gave crucial performances that helped Kent State reach the Elite Eight as a 10 seed by upsetting 7 seed Oklahoma State (69-61), 2 seed Alabama (71-58) and 3 seed Pittsburgh (78-73). His senior season he received Honorable Mention All-American Honors from the Associated Press after averaging 20.6 points, 7.7 rebounds and 4.1 assists per game. He finished with a record of 54-16 in two years of playing. His jersey number, 44, was retired on February 27, 2010, making him just the fourth Golden Flash to receive the honor. After being told by scouts that he was too much of a “tweener” to make the NBA, Gates (6′4″) arranged a workout in front of NFL scouts. Despite never playing football in college, as many as 19 teams were believed to have contacted Gates about a tryout. Gates chose to work out first for the San Diego Chargers. Recognizing his potential, the Chargers immediately signed him to a contract as an undrafted free agent. Lost in the hoopla of this incredible performance, and the disappointment of San Diego's league-worst 4-12 record, was Antonio’s rise from third string to starter by November. After finishing a solid 2003 rookie season in which he caught 24 passes for 389 yards and two scores, he was picked by many experts to have a breakout season in 2004. A preferred target of quarterback Drew Brees, Antonio Gates finished his second season in the NFL with 81 receptions for 964 yards and 13 touchdowns. On December 19, Gates tied the NFL single season record for touchdown receptions by a tight end (12) in a 21–0 win over the Cleveland Browns—he went on to break this record in an overtime loss to the Indianapolis Colts on December 26. Gates was selected to the 2005 Pro Bowl and caught a TD pass from Colts' quarterback Peyton Manning to help the AFC to a 38–27 victory. Additionally, Gates was on the receiving end of a 33-yard pass from teammate Drew Brees in a flea-flicker play selected by fans online. On August 23, 2005, after holding out for a contract extension, Gates inked a six-year deal worth up to $24 million with the San Diego Chargers. Because of his holdout, Gates was suspended for one game–the home opener against the Dallas Cowboys, a loss. Gates went on to have another stellar season, catching 89 passes for 1,101 yards and 10 touchdowns, but the Chargers missed the playoffs by a single win. With the departure of Drew Brees during the offseason, it was assumed that Gates would suffer a decline in production in 2006, with first-year starter Philip Rivers at the helm. Gates had a relatively quiet start to the season, but he finished the year strongly and ended up with 924 receiving yards and nine touchdowns. He caught two touchdown passes on December 10 against Denver to help the Chargers clinch their division. Gates was a Pro Bowler and All-Pro for the third straight year. Undefeated at Qualcomm during the regular season, the Chargers and their fans anticipated a trip to the Super Bowl but they were beaten by the New England Patriots at home by the score of 24–21. In 2007, Gates wasn't selected to the All Pro team but was still a pro bowler. During the season he caught 75 passes for 984 yards and nine touchdowns. He was once again a key factor in the Chargers 11-5 campaign but not during the playoffs. He dislocated a toe on his right foot just before the postseason, which slowed him down during the Chargers playoff run. Gates was not the only Chargers star player injured: both LaDainian Tomlinson and Philip Rivers had leg injuries which dropped the Chargers chances of reaching the Super Bowl. However, the Chargers did eventually reach and play in the AFC Championship which they eventually lost to the 17-0 Patriots. Gates said he was leaning toward having surgery to repair a dislocated left big toe that slowed his performance during the 2007–08 NFL playoffs, but was undecided on whether to have surgery or not, "There is higher chance I'm going to have surgery". Gates also pulled out of his 5th Pro Bowl selection because of his injuries alongside his teammate LaDainian Tomlinson. Gates finished the season with 60 receptions for 704 yards and eight touchdowns. On February 23, 2008, Gates said he would have foot surgery to fix the injury that has hurt him in the final part of the season. He would face a 4–6 month recovery time. He seemed questionable for Week 1 and even sounded worried about his status for the opening day of the 2008 season, however, he ended up playing every game despite complaints that his toe was bothering him during the first half of the season. He finished the season with 60 receptions for 704 yards and eight touchdowns. Finally healthy after a couple injury-plagued seasons, Gates enjoyed the finest year of his career. He caught 79 passes for a career-high 1,157 yards and eight TDs. He hauled in at least five passes in 10 of the team's first 11 games. The team had a great regular season, finishing the year with 13 wins, one of the best records of the year. However they were bounced in their first postseason game by the New York Jets. Gates began the 2010 season by signing a 5-year $36 million contract with $20 million guaranteed. In the first nine games of the 2010 season, he had 40 receptions and 9 touchdowns. Despite being limited by foot injuries throughout the second half of 2010 the season, Gates earned a Pro Bowl selection for his seventh consecutive year; however, as a result of his lingering injuries, Gates did not participate. Gates tried to play through his chronic foot problems but was forced to sit out Weeks 3-5. He came back after the bye week and started every game the rest of the way, finishing with more than 60 catches (64) for the seventh time in his career. He also scored seven TDs and was voted into his eighth Pro Bowl. Gates became the Chargers’ all-time receptions leader on a six-yard catch on a 4th-and-5 early in the fourth quarter against Detroit. It was his 587th career catch, surpassing Charlie Joiner’s 586. Gates had another record making season, becoming the fifth tight end in NFL history with 600 career catches and runner-up for most TDs in Chargers franchise history with 83. The tight end and his quarterback Philip Rivers have proved to be a formidable pair, connecting for a total of 56 TD catches, the most out of any QB-tight end combination in the NFL. Gates played all 16 games for the first time since 2009, finishing with 70 receptions (77) for the fourth time in his career. However, Gates only scored four touchdowns, his lowest total ever since his rookie year. Gates passed Lance Alworth to become the Chargers' career leader in receiving yards in Week 7 against the Broncos. In the season's final game against the Kansas City Chiefs, he became the fourth tight end in NFL history to surpass 10,000 yards in career receiving yards. [lower-alpha 1] He finished the season with 12 touchdowns, becoming the fourth player in league history to catch 12 or more touchdowns in a season at age 34. [lower-alpha 2] His teammates voted him the Chargers' Offensive Player of the Year and he was invited as an alternate for the Pro Bowl, but declined. On July 2, 2015, it was announced that Gates would be suspended for the first four games of the 2015 season for violating the NFL's rules on performance enhancing drugs (PEDs). On October 12, 2015, in his first game back after from a four-game suspension, Gates scored his 100th and 101st career touchdown receptions. On March 9, 2016, Gates signed a 2-year contract extension to remain with the Chargers. On October 3, 2010, Gates became the seventh tight end with 500 career receptions. On February 27, 2010, His number 44 was retired by Kent State. On October 12, 2015, Gates became the ninth player (second tight end) to catch 100 career receiving touchdowns. Gates married his longtime girlfriend, model Sasha Dindayal, on July 9, 2011. The couple resides in Hollywood Hills in Los Angeles, CA. Gates eldest daughter, Ananda Gates, is a product of a previous relationship and resides with her mother in Atlanta. Gates appeared in the fourth episode of season one and the final episode of season six of The League. ↑ The other three tight ends were Tony Gonzalez, Shannon Sharpe, and Jason Witten. ↑ The others were wide receivers Cris Carter, Marvin Harrison, and Terrell Owens. ↑ "Archived copy". Archived from the original on 2012-01-25. Retrieved 2011-02-23. 1 2 Gehlken, Michael (December 29, 2014). "Antonio Gates ends year with milestone". U-T San Diego. Archived from the original on December 30, 2014. ↑ "Archived copy". Archived from the original on 2011-07-19. Retrieved 2011-04-14. 1 2 Jenkins, Chris (December 28, 2010). "Gates, Dielman, Rivers voted to Pro Bowl". The San Diego Union-Tribune. Archived from the original on January 31, 2011. ↑ Acee, Kevin (October 23, 2014). "Gates breaks yardage record, still going". U-T San Diego. Archived from the original on December 7, 2014. ↑ Gehlken, Michael (December 23, 2014). "Eric Weddle selected to Pro Bowl again". U-T San Diego. Archived from the original on December 30, 2014. ↑ Henne, Ricky (December 29, 2014). "2014 Team Player Awards Announced". Chargers.com. Archived from the original on December 30, 2014. ↑ Hanzus, Dan (July 2, 2015). "Antonio Gates suspended four games for PEDs". NFL.com. Retrieved 2015-07-02. ↑ Brady, James (March 9, 2016). "Chargers agree to 2-year extension with longtime TE Antonio Gates". SB Nation. Retrieved 2016-03-09. ↑ "Antonio Gates of San Diego Chargers catches 100th career touchdown". ESPN.com. Retrieved 2015-10-13. 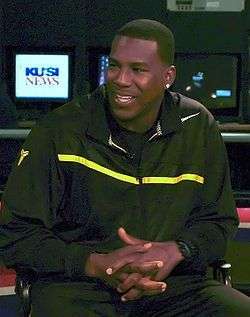 Wikimedia Commons has media related to Antonio Gates.